You may remember how we used kitchen cabinets for storage in our bathroom closet. It ended up working out so well and provided us SO much storage that we decided to do it again! We wanted a sideboard for our office/playroom but didn’t like the price tag of the more modern ones we preferred. While we were at Ikea picking out the components for my desk, we stumbled upon these new matte black kitchen cabinets and immediately fell in love. 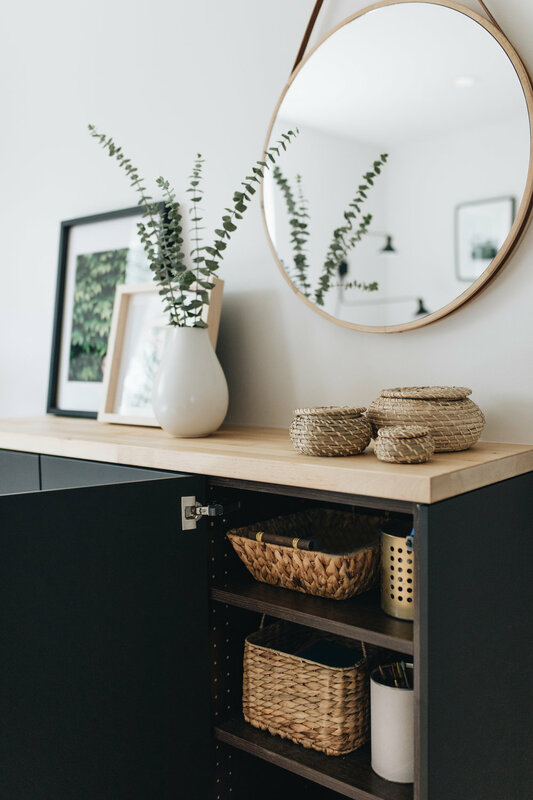 All cabinets come with mounting rails and provide more than enough support - so any kitchen cabinet can be magically be turned into floating storage! We are familiar with the BESTA line and have used it before, but this time BESTA wouldn’t do the trick. We needed storage that was narrow and tall - something our children could store books and toys in WITHOUT it protruding too far into this small room. We picked out beech kitchen counters to use as a surface for our cabinets and had enough leftover to use as shelves (more on that coming later!). We used 3 of the 15x15x30 Sektion Wall Cabinets with the Kungsbacka Anthracite doors. In lieu of cabinet hardware, we used URUSTRA push openers for a more streamlined look. 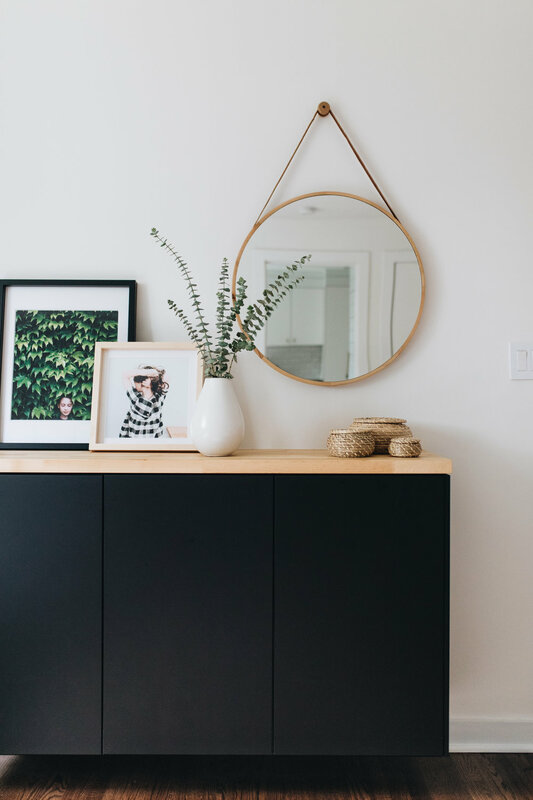 When we mounted them on the wall, we made sure that the spacing off the floor was similar or equal to the spacing off the floor of our sofa - to give a more cohesive look to the room. The cabinets sit about waist-high for me -the perfect height for styling! Moment of confession - this project has been completed for months. But for some reason, I was so stressed about this post! I wanted to shop for the perfect props and have the cabinets styled just so. I’d been searching far and wide and inspiration was NOT coming. After a frustrating day of shopping - I put my phone away, sat down with the kids on the new sofa, and turned on Netflix. We watched this new documentary called “Tales by Light,” a beautiful show about adventure photographers (hello, dream job!). We were 3 episodes in, and FINALLY there was an episode about a female photographer and lemme tell you - her story really spoke to me. Unlike all the other men featured on this show, her gear was minimal and light. She was working on a story about a free diver in Vanuatu. She photographed him in the water at dusk while a villager shined a single light beam into the water. If you know me, you know I am just a little bit obsessed with light beams. :) When she spoke about capturing this shot she said this: “The image that had been playing in the back of my mind for a year now…it’s really simple. That’s the thing I was taught when I first got into photography…it’s to KEEP IT SIMPLE.” It was then that I decided I was going to take these photos tomorrow - and it was going to be ok. I already had these beautiful frames from Artifact Uprising and a favorite little set of woven baskets from IKEA. I bought some Eucalyptus from Trader Joe’s and called it a day. And as it turns out, simple was just fine.